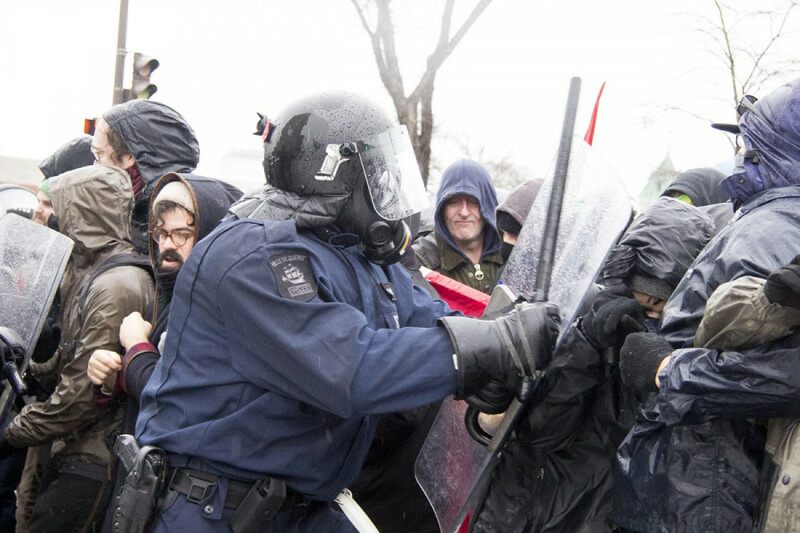 Despite showing little provocation, Quebec City police pepper sprayed counter-protesters and pushed them out of the way to make space for far-right groups La Meute and Storm Alliance in front of the National Assembly. Just afterwards, Atalante, an openly neo-nazi group, took to the top of the wall by the Assembly and rolled out a sign reading “Le Québec aux Québécois.” Police showed no reaction. In an effort to analyze the degree to which the Quebec City police and far-right groups in Quebec communicated with each other leading up to the mass demonstration held on Nov. 25, The Link sent out an access to information request to the SPVQ. That day, both groups surrounded the National Assembly to denounce the Liberal government’s plan to hold a one day forum “validating diversity and the fight against discrimination,” a watered down version of what was originally meant to be a full-on commission into systemic racism in the province. Just after the demonstration, the CBC reported that Quebec City police held five discussions with La Meute in the weeks leading up to the demonstration. “We had a very good collaboration with La Meute. They told us their intentions, their itinerary, where they were headed,” said André Turcotte, a spokesperson for Quebec City police, to a CBC reporter just after the event. We hoped to learn the content of those five discussions. So we sent out an Access to Information request asking to see all records of communication between the SPVQ and far-right groups La Meute and Storm Alliance between Aug. 20 and Nov. 28, the day we sent the request. We asked for emails, audio recordings, videos as well as any other documentation relating to that communication we heard was going on in the planning period before the Nov. 25 demonstration. La Meute officials said that former head of the group Sylvain Brouillette and their head of security Jacques Gagné, who was once an officer for the Quebec City police, both attended these meetings—but the SPVQ said they’re unable to give up any documents related to what was discussed in these meetings. They claimed they couldn’t provide us with anything because they don’t actually have any records of their communication with far-right groups within that time frame. Police told us they have no records of communication with these groups because they had only spoken with these far-right groups over the phone. When asked why that was the case, they said they never record phone conversations related to protest permits. But I have a hard time believing that. Does the SPVQ really keep no records of their communication with far-right groups, or is it that they just don’t want to make those records public? And even if what they were saying is true, why is it that the SPVQ doesn’t keep any recordings of their conversations with far-right groups over the phone? With what happened the last time La Meute demonstrated in Quebec City, it’s concerning that the SPVQ failed, and perhaps chose, to not keep records of their communication with far-right groups between Aug. 20 and late November. In late August, a La Meute rally near the National Assembly caused public uproar. Hundreds of counter-protesters came to derail their protest, leaving La Meute trapped in the hot basement of a parking lot they were using as a meeting point for hours. The fact that the SPVQ failed to keep records of their communication with La Meute and Storm Alliance in the weeks leading up to the demonstration in late November shows negligence on their part. It shows they don’t take the threat of far-right groups seriously, and while most Quebecers don’t personally feel threatened by La Meute, many Muslims in the province have legitimate reasons to feel threatened by their presence, whether that be in Quebec City or in Montreal. That or they are simply choosing to not be transparent with the public. A recent episode of Enquȇte showed that in 2012, some Montreal police officers purposely avoided keeping debriefing notes or similar records to ensure certain information won’t be disclosed through access to information laws. This was shown through audio obtained from a conversation between commanding officer Roch DeRoy and a Quebec Superior Court judge. 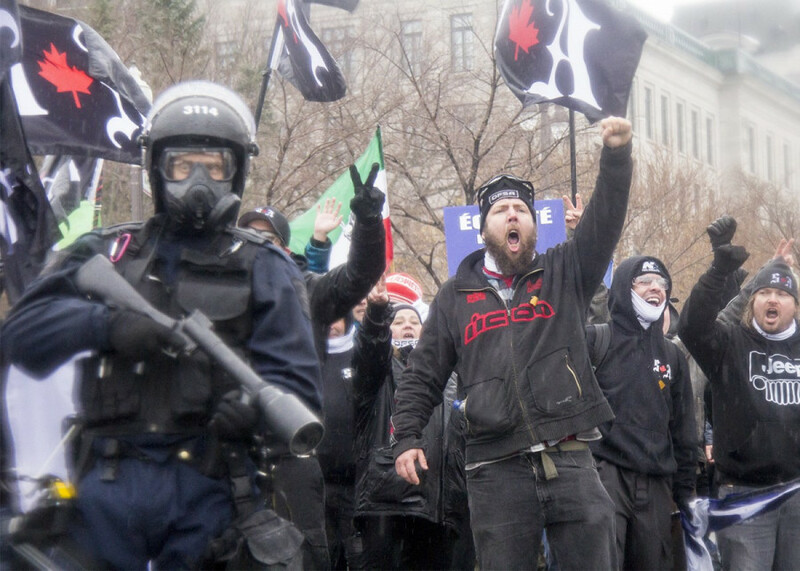 Like CBC journalist Jonathan Montpetit pointed out in the days after the Nov. 25 demonstration, far-right groups strategically make use of law enforcement to make their movement seem less extreme and more palatable to the public. By following police orders, far-right groups are able to contrast themselves with counter-protesters who don’t get an equal right to protest. Because police most of all want to keep both sides separate to avoid violence, any attempt by counter-demonstrators to get a protest permit for the same time and space would have been automatically denied. This makes them more vulnerable to getting brutalized by the police, and also serves to delegitimize the anti-fascist movement. All this contributes to the normalization of far-right groups in the province. This tactic later allowed the space for extreme far-right groups like the III% and Atalante to walk alongside La Meute and Storm Alliance on Nov. 25—all while getting to enjoy the same wall of police security that protected them from groups hoping to stop them from taking to the streets. 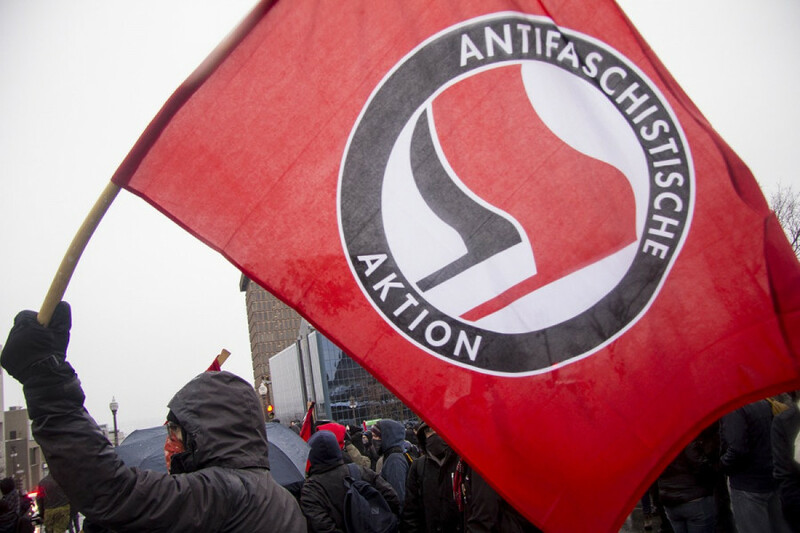 And while the far-right is increasingly normalized, anti-fascist movements which have gained momentum in increasing years are now being investigated by the Montreal police through their hate crimes unit. Mtlcounter-info.org is an anarchist site that’s been known to doxx white supremacists and expose the private conversations of far-right groups that aim for the mainstream (and that also admittedly sometimes gives instructions on how to put together molotov cocktails). It’s often frequented by anti-fascist activists and used to analyze the movement’s tactics. Now the Montreal police hate crimes unit is investigating the site, and has obtained a list of all the IP addresses of users who accessed the site through links on Facebook, from Facebook itself. It’s equally as unclear what the SPVQ is doing to address these groups that spread hate, though after Aug. 20 it was clear the SPVQ was ready to begin an investigation into anti-fascist demonstrators. It’s what happens when far-right groups abide by the law. Because they work with police, it makes it easier for the SPVQ to say they don’t need to be looked into, and to have an excuse to instead focus their attention on anti-fascists, who challenge their authority in a way the far-right doesn’t. What Far-Right Groups are Active in Quebec?